OSSTET Question Paper, Pattern & Syllabus 2016-17. Odisha Secondary School Eligibility Test 2016-17. First Time Odisha Govt Introduced OSSTET Test. Qualified Candidates Are Eligible for Secondary School Teacher Posts. 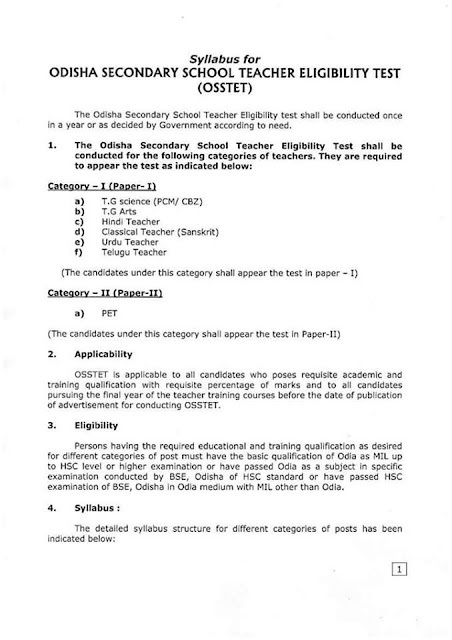 Soon Odisha Govt Will Publish OSSTET Test For Eligible Candidates. Candidates Are Recruited On the Basic Of their Eligibility & OSSTET Test. Candidates Having Required Qualification 12th, Graduation Can Apply for OSSTET Test. Must Have Studied Odia as Language In 10th & 12th . Candidates Can Apply OSSTET Exam Application From BSE Odisha Official Website www.bseodisha.ac.in. Online Apply will Available from 21/10/2016 to 11/11/2016. The Mode Application Fee Payment Is Online and Offline through SBI Net Banking or Offline Challan from sbi Branches. How to Apply- Details Given Bellow. Candidates Need to Visit Official Website of BSE Odisha, Then Fill required Details. After that Candidates Need to Deposit their Application Fee. OSSTET 2016 Online Apply Here. If you have Query regarding OSSTET Exam Comment your Query Bellow.